Every place has its myths and legends -- and the more remote and evocative a place, the more legends it acquires. They’re told around campfires, repeated among friends, even sung over the radio.Some are beautiful, some are grisly, and a few are completely nonsense. The Traverse City area is certainly no exception, and here are a few of the better-known local myths. The whimsical Mission Table restaurant: spirits, definitely; ghosts, maybe not. For years, the former Bowers Harbor Inn on the west-facing shore of the Old Mission Peninsula has been touted as Traverse City’s most famous haunted spot. 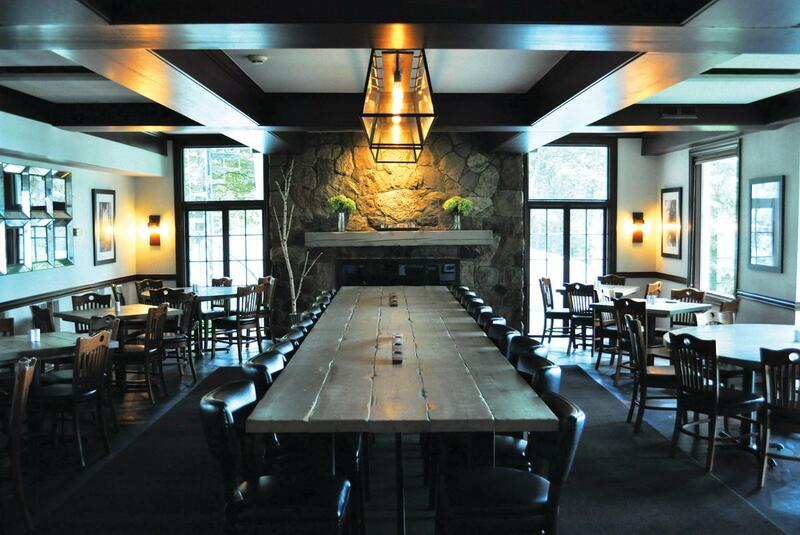 Guests, employees and visitors to the inn (now the Mission Table restaurant) insist that they have experienced strange rapping noises, doors slamming, lights suddenly turning on, mirrors and paintings falling from walls. The spirit responsible for all these goings-on is supposed to have been the ghost of “Genevive Stickney,” whose husband built the rambling waterfront home in the 1880s and who is said to have died in the house under tragic circumstances. In fact, over the years a soap-opera story has been built up around “Genevive” and her family, aided and abetted by credulous journalists (of whom I was one). The tale -- that she was a jealous, overweight wife who hanged herself in the elevator shaft -- has been featured in several books and television programs. Except that none of it turns out to be true. Thanks to local historian and writer Julie Schopieray, we now know that the Stickneys were a normal couple who spent many happy years together in the gorgeous, quirky home at Bowers Harbor. Mrs. Stickney’s name was Jennie, not Genevive, and she died in Grand Rapids in the Pantlind Hotel, now the Amway Grand Plaza. Her husband died two years later, at Munson Hospital. They were in their eighties, and the lurid stories told about them are pure fabrication. Is there a “haunting” at Mission Table? I couldn’t say. Old buildings make noises, and strange things happen for any number of reasons. There certainly are plenty of spirits at Bowers Harbor, since the restaurant is home to a fine microdistillery, but I’m assured that they’re all eminently Civilized. Photo: Traverse Magazine | Do these lovely waters conceal a hideous monster? Every lake should have a monster of its own -- especially if that lake also happens to be the home of a summer camp. And the famous Torch Lake Monster doubtless owes its longevity to the existence of Camp Hayo-Went-Ha on its northern edge, where generations of youngsters have shrieked around the campfires to tales of a giant creature -- "one eye brown, one eye blue, his body covered all in icky green goo" -- that lives at the bottom of the lake and rises at night to terrorize boaters, swimmers and unwary campers who venture where they’re not supposed to venture. First of all, it’s unusually deep -- 285 feet at its deepest point and with an average depth of 111 feet, it’s the deepest inland lake in Michigan. 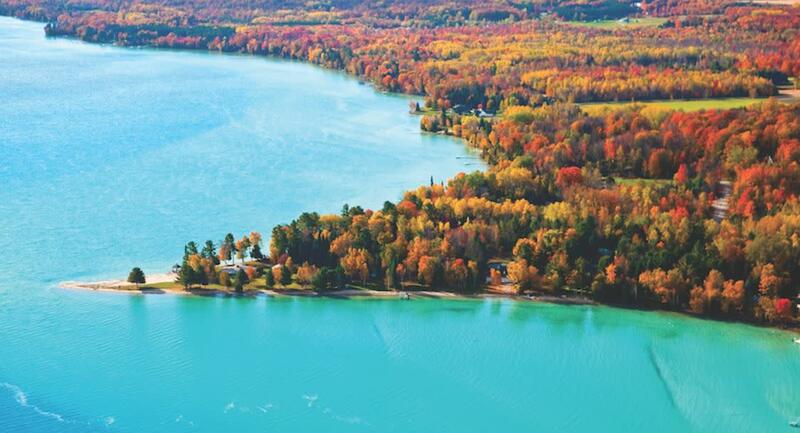 Early visitors used to speculate that it was literally a “bottomless” lake, connected to nearby Grand Traverse Bay by underwater tunnels. There were persistent though unsubstantiated stories of people who drowned in the lake whose bodies washed up in the Bay. Or vice versa. It’s also unusually clear -- one of the clearest lakes in the world, in fact -- and in those crystal-clear depths lurk some extremely large fish. You might almost call them, well, monsters. Last fall, in fact, a 50-pound muskellunge, almost five feet long, was caught in Torch, the largest ever caught in the state. And if you know what rapacious, hungry fish muskies are, you could easily spin a horror story out of that one. That seems to be what happened in 1987 when a pair of Traverse City radio personalities -- Jack O’Malley and Steve Cook of WTCM -- decided to concoct a scary story for April Fools&apos; Day. They made up a “legend,” complete with a bogus pedigree and a folksy song, about a frightening creature that roamed the North Woods -- a large beast with the body and features of a dog that walked on its kind legs like a man. The Dogman. The song (called “The Legend”) became a local hit. But then the truly weird stuff began. Local listeners started calling the station to report their own encounters with something that sounded very much like the Dogman. Without really intending to, it seems that Cook and O’Malley had tapped into some deep vein of cryptozoological Up North lore, a story line that goes back at least 200 years. Even then, the whole thing might have faded away -- but later that year police reported that an isolated cabin near the village of Luther had been attacked and damaged, apparently by a large dog. And that was enough for the Dogman story to become a national sensation. More stories appeared, including one from a man who claimed to have seem the thing back in the 1930s while fishing. In 2012, Traverse City filmmaker Rich Brauer even made a movie version of “The Dogman” starring Larry Joe Campbell. And every year around Halloween, WTCM dusts off “The Legend” and plays it for old times’ sake. But Cook, who started the whole story, remains a skeptic about the creature’s actual existence -- though he doesn’t question the motives of those who claim to have seen it.